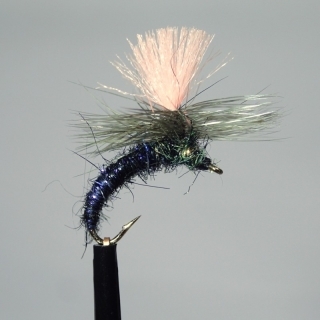 Andy Pfirstinger's TROUT&GRAYLING MAGNET is a very effective dry fly or rather emerger, because it is a fly pattern whose body is hanging deep below the water surface. Because of the extra-long abdomen and the extreme bend it could be described as a ''Klinkhammer extreme''. The pattern's name Trout & Grayling magnet has been derived from the fact, that it attracts the fish like a magnet, bringing them up to the surface. Even in situations when no fish rise, all salmonids can be equally tempted with the T&G Magnet to come up and take the fly, sometimes from a depth of 2 meters (7 feet). Besides the silhouette the used Ice Dubbing in the colors UV Black and Peacock certainly adds to this appeal. The pink visual aid above the Parachute does not bother the fish - quite contrary - it allows the angler to see and follow the fly even at long range quite excellent. For the fish' sake all AP Magnets have the barb already clamped down.